Complete Privacy Harris Lake Masterpiece! Complete privacy is offered in this 4,500 sq ft masterpiece on Harris Lake! Over 1,900' ftg on Harris Lake, 431' ftg on Harris Creek & 6.29 acres! 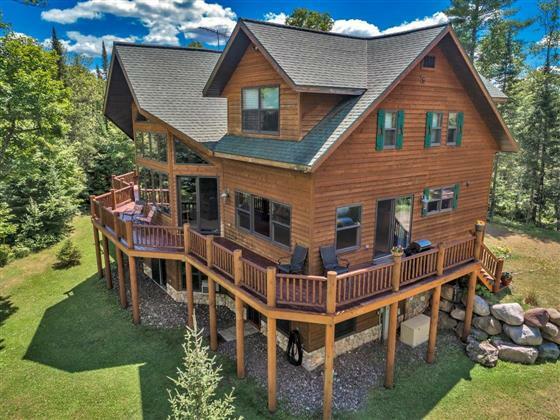 Thoughtfully designed using the finest materials this cedar sided 5BR, 4.5BA home includes LR w/fieldstone wood burning FP, basswood cathedral ceilings, built-in TV cabinet, wall of lakeside windows & patio door to lakeside deck. K w/wood floors, granite tile counter atop custom wood cabinetry, center island breakfast bar & walk-in pantry, is open to the DR w/wood flooring & patio door to deck. Main floor MBR suite w/walk-in closet & private master BA! Upper level has large loft area & 2 large BR's with full jack-n-jill bath. LL has family/rec room w/patio doors to lake, 2nd MBR suite w/private BA plus another large BR & full bath. Utility room is partially finished with access to lake. Detached 3 car garage has great upper level storage! VERY private setting on this fabulous lake! Close to snowmobiling, UP Ski Hills & Win-Man Trails!